Barre Fitness - a dance and pilates inspired fitness franchise - had grown organically to 5 locations during their first 8 years in business. They came to Sparktank to take their success to the next level and promote their opportunity across Canada. Having a compelling and professional website that is geared to prospective franchisees is a must have for any recruitment campaign. Working with our writing and design team, we crafted a fun and inviting website that really showcased Barre’s personality and the benefits of owning a studio. We highlighted the positive experiences of their current franchisees through video and with mini success stories. The website was a hit with both the Barre team and franchise applicants. 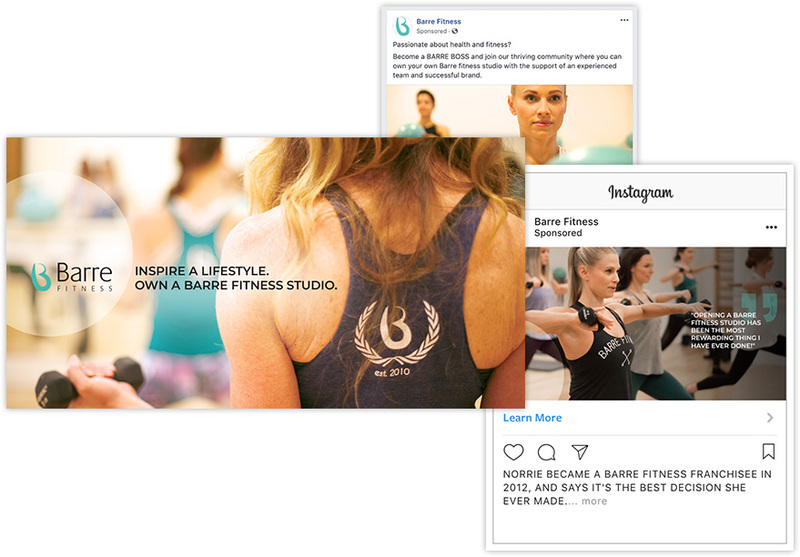 After consulting with Barre on their ideal franchisee prospects, we felt that Facebook and Instagram would be the best channels to advertise on. Having worked on numerous franchise recruitment campaigns on these channels, we knew how to best utilize Facebook's advanced targeting to appeal to very specific prospects in the geographic areas Barre was looking to expand into. We also designed a series of custom video and graphic ads to entice people to check out their new website and make an inquiry. They're extremely knowledgeable, they're responsive and they took the time to understand our brand, our target market and our goals [...] I'm proud that our work with Sparktank has helped us to surpass our launch goals.